Three leaves from a copper beech tree outside the place my dad is being taken care of. As we went north, we traveled backwards through spring. The leaves shrunk and shrivelled, and collapsed into buds, the blooms turned from aged and browning to tiny and brilliant in golds and greens and pinks. The beech tree was perfct for climbing. Alice had limited tolerance for sitting beside a bed, so she'd go out and climb and read, and come back and check on us. I love the squiggly center line of the leaves at the top; that will straighten out as the leaves age and harden. These are real leaves, held in place with silk organza and fusible web. 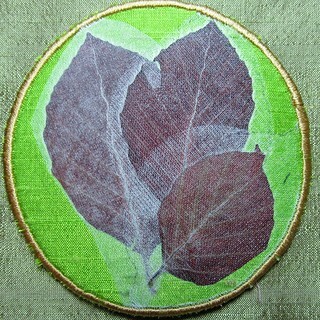 I think part of the piece is about aging and change, as much as the leaf itself, and the circle. I'll keep this one pinned to the wall and watch it change.